Is there a way to do the above rather than just drawing a textbox at random? Since I posted my question, I found that if I hold down the Alt key and press the left mouse button, it brings up a box called Paragraph Text Size which allows me to enter my dimensions for the text box. You got it! The Paragraph Text feature will do what you want. Thanks for posting back! 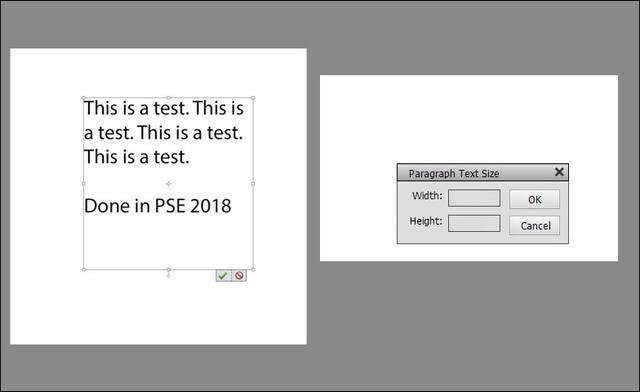 Hmm, that doesn't seem to work in PSE 2018. Creating a Paragraph Text is a standard feature in Elements. It works just fine in PSE 2018. When you create a paragraph text, a dialog box will pop up to allow you to enter the desired dimensions for the text box. This technique is described in the tutorial below (Step 4, Method 2). Argh! I got it into my head that I should press the right mouse button. Works fine using the left. Thanks for the tutorial.